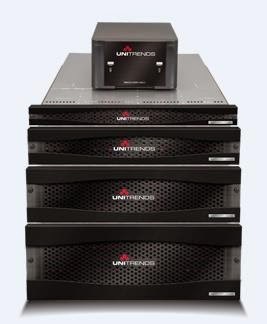 Unitrends recently released the third generation of its Recovery Series backup appliances. Featuring 11 new models with capacities ranging from 1TB – 97TB, these all-in-one integrated appliance models are designed to increase I/O bandwidth, manage growing data volumes, tighten backup windows, and maximize deduplication performance. Bringing together faster CPU clock speeds, AES-NI hardware encryption, hardware RAID, and more, the amount of data users can protect a day spans from 2TB/day to over 6TB/day. The new Unitrends Recovery Series also features the industry’s first use of solid-state drives (SSDs) as a 2nd-layer read cache in result speeding up read requests and increasing data I/O. With the use of SSDs, users can see a 300% improvement in backup RPO and a 125% improvement on recovery times. As the only desktop model in the new series, the Recovery-201 features 1TB of raw capacity, 600GB of backup capacity, 8GB (dual) memory, and 2 cores. With ten new rackmount models, eight of them (starting in Recovery-713S and up) feature the flash cache SSD. The Recovery-602 and Recovery-603 1U models feature 8GB (dual) memory with the Recovery-602 containing 2TB of raw capacity and 1.2TB or backup capacity, and the Recovery-603 featuring 3TB of raw capacity and 1.6 TB of backup capacity. The SSD appliances include models Recovery-713S, Recovery-714S, Recovery-814S, Recovery-823S, Recovery-824S, Recovery-933S, Recovery-936S and Recovery-943S with raw capacity ranging from 6TB to 97TB, backup capacity ranging from 3.2TB to 50TB, and memory ranging from 16GB (dual) to 256GB (quad). These flash-enabled devices are built from the ground up to handle the increasing demands of coping with growing virtual and physical data volumes, faster backup and recovery windows, and the incorporation of the hybrid cloud. All of the models in the third-generation Recovery Series feature best-in-class unification across physical and virtual servers as well as many operating systems and applications. Simplified administration provides seamless integration with virtual and physical applications. With centralized management of data protection, the Unitrends Recovery Series protects data in branch and remote offices while reducing operational costs and improving disaster recovery preparedness. With this next-generation hardware, the third-generation of Unitrends Recovery Series backup appliances provides greater scalability and flexibility, and improved backup performance.